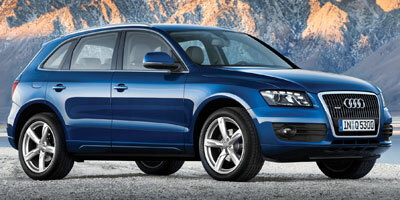 Audi plans to be a major player in the luxury compact SUV and crossover market with its new Q5. A segment dominated by the likes of the BMW X3 and Acura RDX, there isn’t much room for a new kid on the block – unless that newcomer happens to hail from the family that practically invented full-time all-wheel drive. Smaller than the three-row Q7, the Q5 still manages comfortable seating for five, a serious tow rating and plenty of power, thanks to a 3.2-liter V-6. This CUV also benefits from all of Audi’s proprietary innovations, like Audi Drive Select and a clever, new-generation MMI system that’s finally as intuitive as the company advertises. Inside, the cabin is quiet and comfortable, filled with the kind of materials you’d expect of a car from Ingolstadt. We’re betting the company’s new baby ute will become the kind of benchmark the competition can only hope to emulate. Where to start? 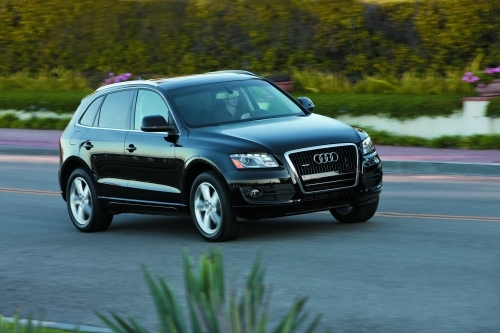 Audi has paid an excruciating amount of attention to every detail in the 2009 Q5. Stylish inside and out, the design is attractive without being gaudy. From behind the wheel, this CUV succeeds where so many crossovers have failed – it actually drives like well-toned midsize sedan. For now, Audi is only offering a 3.2-liter V-6 with the Q5. And while the engine is more than capable, it’s also thirsty. If we’re paying 17/24 mpg (city/hwy), we would like a little more power. The company is also keeping its fantastic dual-clutch transmission out of U.S. models for now. 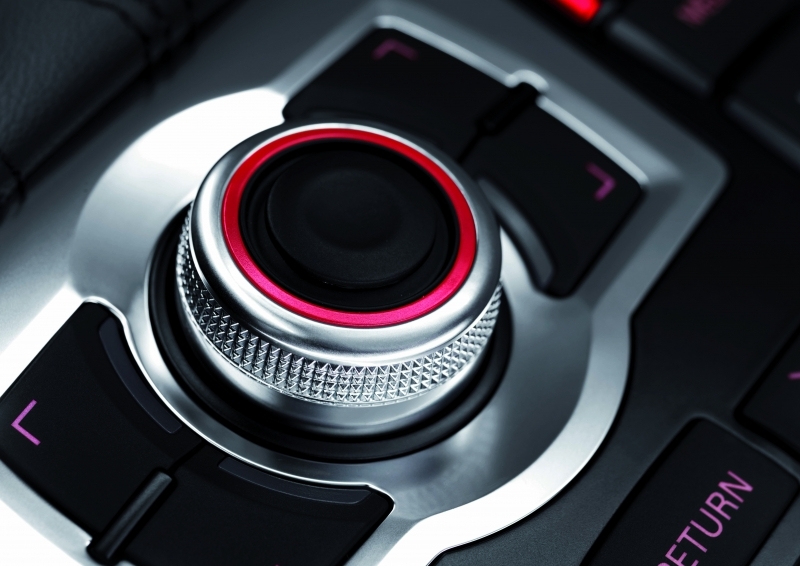 Thanks to the standard Audi Drive Select, drivers can choose between three sets of parameters depending on the level of comfort or performance they prefer. The result is a near-perfect drive for just about anyone. Steering is well weighted and responsive, and the suspension can keep up with even the most abrupt of driver inputs. The Q5 doesn’t seem to suffer from the painful body roll or nose dive that plagues the majority of competitors in this segment – giving the vehicle a firm, planted stance that builds confidence over time. Meanwhile, passengers are treated to a comfortable ride that handles undulations in the pavement with ease. Power from the V-6 engine is enough to put a smile on your face, and the Q5’s capable brakes are stout enough to keep the two-ton ute out of trouble when traffic bows up. We found ourselves looking for excuses to slide behind the wheel. That’s rare enough in any sort of vehicle, and unheard of in a crossover. For now, Audi is offering a 3.2-liter FSI V-6 engine with 270 horsepower and 243 lb-ft of torque, though a turbocharged four-cylinder may come in following years. Coupled to a quick-shifting six-speed automatic transmission, the engine provides almost instantaneous pep. Audi’s remarkable Quattro all-wheel drive system keeps the Q5 going, even in the slickest of conditions. Audi has finally managed to get its previously cumbersome MMI system under control. The third-generation is intuitive and helpful, allowing the driver to easily negotiate between the Q5’s navigation, SIRIUS satellite radio and CDs or media. There’s even a convenient joystick that allows the driver to manipulate the nav system maps. What’s more, the system now accepts simple voice commands for destination input. 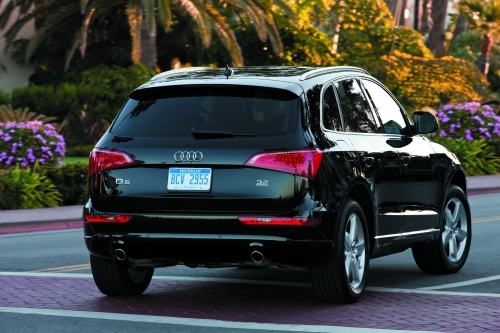 Just say “I’m hungryâ€ and the Q5 will provide you with a list of local restaurants. Aside from the usual array of stereo, navigation and entertainment, the Q5 also boasts a fantastic stability assist system. Called ESP, the system gently steps in if you find yourself doing something you shouldn’t be behind the wheel. You can also get your CUV with Audi’s clever Dynamic Steering – a system that will actually change the Q5’s course to help avoid an impact. As we mentioned earlier, the Q5 isn’t the greenest CUV out there. At 17 mpg city, 24 mpg highway, fuel economy rests in the realm of larger, three-row SUVs. Still, the Q5 is fairly clean, carrying a 0LM California emissions rating. Inside, the Q5 offers up comfortable seating and fine materials for everyone. Three climate zones come standard to keep all passengers comfortable, and the 12-way adjustable front seats can accommodate pilots of any size. Though the rear cargo area doesn’t offer up cavernous space, the rear seats fold quickly and provide more than enough room for larger goods. Audi has done a great job of translating the smart lines of the (frankly massive) Q7 into a much smaller package. Whereas some CUV’s tend to have bulbous proportions, the Q5 is sleek and low-slung. Familial headlights and grille help to distinguish this ute from the crowd, and with the addition of Audi’s optional off-road appearance package, the crossover looks like it could take on any terrain. The Q5 is set to go head to head with a packed segment. Priced at $37,200, the Q5 has plenty to offer against the likes of the Acura RDX at $33,895, the BMW X3 at $39,700, Volvo’s capable XC60 at $37,200 and the Infiniti EX35 AWD Journey at $36,850. Still, adding on all-wheel drive and the laundry list of luxury amenities the Q5 boasts as standard will push the competitors’ price tags north. Audi isn’t one to offer a sub-par product. The company seems to pride itself on building the best possible vehicle within a price point, and the 2009 Q5 is the latest example of that mindset. With near-flawless driving characteristics and an arsenal of stability and traction assistants, the Q5 provides one of the best motoring experiences in the segment.